Imagine you’re the owner of an International luxury resort chain, and you’re meeting with an American golf architect who was recommended to you – to design the golf course at one of your newest high-end locations. You meet him, exchange pleasantries, then ask about his plans for the site -- and he tells you flat out that he hasn’t got any. 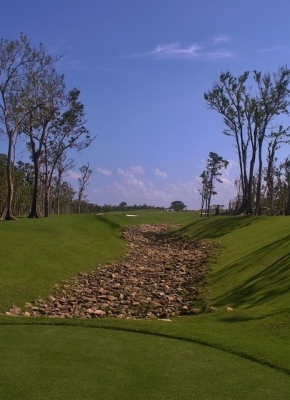 The 171-yard, par three 2nd hole introduces you to the 'look' of Playa Paraiso -- what appears to be waste areas with lots of white limestone rocks that look like golf balls. That’s the situation Don Miguel Fluxa (Owner and CEO of Iberostar Resorts & Hotels) faced when he met with PB Dye to talk about the proposed building of a golf course to compliment his Iberostar Paraiso Maya Resort, along the sunny, sandy shores of the Yucatan Peninsula in Mexico (at Riviera Maya, close to Cancun). The golf course is called Playa Paraiso, and now occupies a good chunk of the grounds of the resort. Those who’re familiar with PB Dye’s rather loose and unique style probably could’ve prepared Fluxa for what he was about to hear, but it still had to come as a shock nonetheless. Why would you invest millions of dollars in a venture where the ‘artist’ involved can’t tell you anything about the masterpiece you’re about to receive? It makes you wonder what the Pope would’ve said if Michelangelo had just kind of sketched out the Sistine Chapel as he went along. Looking from the tee of the par four 15th hole. The dogleg left is clear to you, but plenty of trouble awaits if you're not hitting straight. 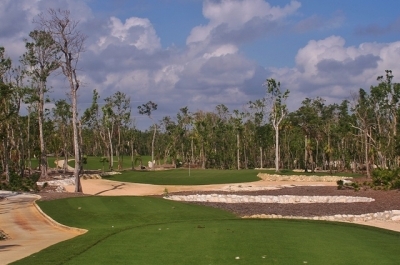 Whatever the reason, Fluxa hired Dye for the job, and the gamble paid off -- it’s safe to say, that the Cancun/Riviera Maya region has another first-rate golf facility to service the large groups of tourists that flock to this area 365 days a year. A rock 'stream' leads you home off the tee of the 427-yard, par four 9th. Dye said at their first meeting, Don Miguel indicated that they might want his father (Pete Dye) involved in the project, but after a good sit-down meeting and long dinner conversation, Fluxa gave the go ahead for PB to handle it solo. “I assured him I would give him my best effort,” Dye emphasized. Fluxa must’ve been convinced, since preliminary engineering on the Playa Paraiso golf course began the next day. Dye said his first visit to the Iberostar property impressed him beyond belief. He was amazed with the creativity, imagination, service and organization exhibited at the resort, which was especially notable for such a large hotel chain. For you similarly unfamiliar Americanos, it might be an eye-opener to discover that the Iberostar network includes over 90 hotels and resorts on four continents, with new ones being introduced all the time. 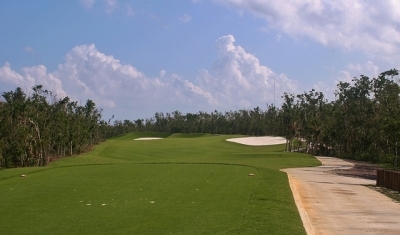 The Playa Paraiso golf course itself is easily accessible to four more Iberostar resorts, Paraiso del Mar, Paraiso Beach, Paraiso Lindo, and the brand new ultra-luxury five-star Grand Hotel Paraiso (set to open in December, 2006). Pick how much of the leg to cut off on the par four 11th hole. Plenty of room waits to the right if you want the safe route. That’s a lot of fun and relaxation to go ‘round, and now there’s golf to go along with it all. 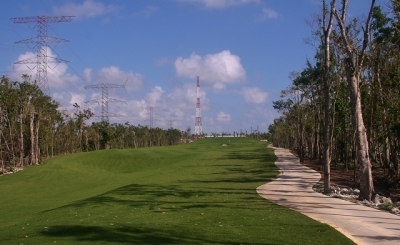 The end product is certainly a site to behold, but judging by the land surrounding the facility – you had to figure it was quite a task to build a golf course in this location. We saw it a couple months after Hurricane Wilma blew through in October of 2005, but even then you could see just how densely wooded this region is/was. It's a good idea to club down off the tee of the 377-yard, par four 4th hole. If you've got any curve on your ball, you're in the woods. In other words, not only was the site comprised of jungle scrub and rocks, it didn’t have great water either. The well water on site was very high in sodium – so the high salt and drought tolerant Paspalum grass provided a sound solution. Paspalum is becoming fairly common in these types of hot, semi-arid seaside locations – and it’s actually a nice surface to play on, very similar to Bermuda grass. Beyond the trees and water, the nature of the soil was difficult to deal with, too. 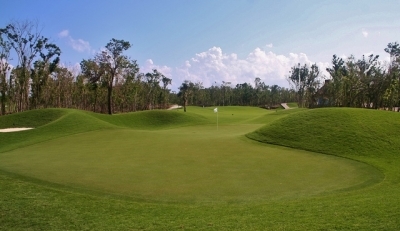 “The challenge in building the course was that the native ground material was a very rocky form of limestone called ‘sascap.’ This limestone is not compatible with the normal grasses used on most golf courses, which necessitated the use of the Paspalum grass, and also creates a challenge for irrigation,” Dye explained. The process eventually worked, with hard work and direction by the on-site construction superintendent, Chip Caswell – as well as the local labor force that was involved with landscaping the site. Playa Paraiso opened in June of 2005, and hit stride fairly quickly. The service was outstanding, worthy of a high-end stateside resort course. Visual intimidation is the order on the par three 12th hole. The flag looks like it's tucked right on the water, but there's actually a lot of room to land your ball safely. Bond said the golf course itself probably lost around 5,000 trees, yet stayed closed for only a few weeks. 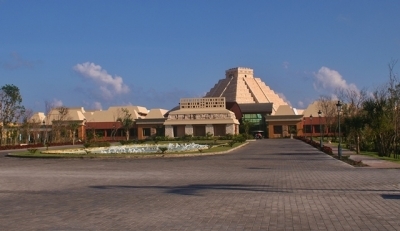 The island of Cozumel (about seven miles off the coast) was hit much harder, yet even a good deal of the island’s facilities were back on-line by the middle of January (2006). Bond said the land that the golf course is on used to be a ranch, called ‘Rancho Lomo Bonita,’ so it’s obvious this region is somewhat conditioned to a rugged way of living. At 463-yards, the par four 8th hole is Playa Paraiso's longest par four -- and the second shot is uphill, too. Luckily, Dye gives you a lot of space to land a driver here. “There was rumored to be a flat lie somewhere out on the golf course, but that turned out to be just a rumor,” Bond said with a chuckle. And of course if there was a flat spot, PB Dye took care of that with his mounding. Because Dye is so ‘freelance’ in his design methods, you’re likely to see just about any kind of shape on his courses, with lots of little bumps and swales. Not only does it play havoc with your fairway lies, it makes for an exercise in navigating the cart as well (in spots). From in back of the par five 14th hole, you can see how Dye uses mounds to frame the green. You can land the ball just off the putting surface and still be several feet above it. Those bumps are beneficial in some ways, too, as if you hit one to the sides of hole with a slope, it will tend to push the ball back towards safety. You take the good with the bad in those circumstances. 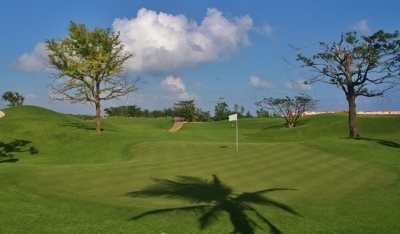 Playing the course, you’ll note that Playa Paraiso is tighter than its typical American resort cousins, which puts a premium on driving the ball straight – and there’s also an emphasis on accuracy approaching the greens, because of those Dye bumps and swales. With Dye, expect the unexpected… but take it all with a sense of humor. Four sets of tees size up the challenge accordingly, stretching out to over 6800 yards – but you’ll have to go on the scorecard’s ‘handicap’ recommendation for suggested tees, since there aren’t any totaled-up number figures for the entire 18 holes (the first time I’ve ever seen that). Playing from the next-to-last set was a fairly enjoyable time, though I can see that playing from the tips would be quite a challenge on some of the real tight holes. 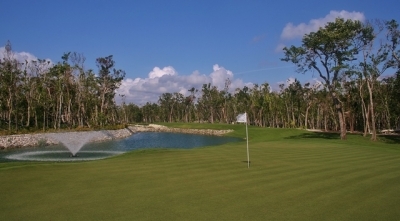 The 144-yard, par three 6th hole is the shortest at Playa Paraiso. The water looks scary from the tee, but you also need to guard against going long. Seeing as we played Playa Paraiso with our Princess Cruise group (arranged through Elite Golf Cruises and our ship’s golf professional, Kevin Mumford), we noted that nearly all the clientele were tourists. Bond says about 85% of the players on the course are tourists, with the balance being locals. Because golf is becoming so prevalent in this area of Mexico, however, Bond says they’re seeing a lot more natives taking up the game – and there are a lot of great courses ‘down there’ to learn on. 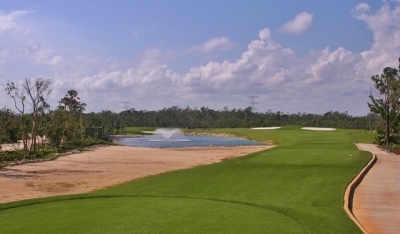 Hole highlights at Playa Paraiso include the sixth hole, a 144-yard par three over water with some attractive rock work bordering the pond, and a fountain in the middle. 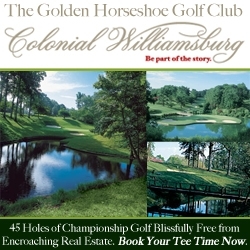 Though this is a short hole – pay particular attention to where the tees are placed, and the yardage markers by them. The par five 18th hole's green is well guarded with mounds, swales and a couple trees. This is PB Dye's imagination at work. 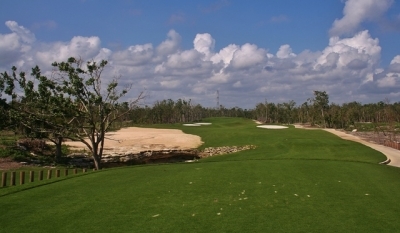 The ninth hole is a challenging uphill-on-the-second-shot par four, most notably with the resort’s Mayan pyramid as the backdrop to the green. On the back nine, the twelfth hole is another attractive par three over water, this time a bit more challenging at 195-yards in length. There’s a healthy amount of space to the right for a bail-out should you choose not to go up against the water. The final hole is an interesting par five with plenty of room off the tee but narrows considerably closer to the green. You won’t earn an easy birdie or par here, but thanks to PB Dye, you’ll definitely remember the last shots you’ll hit at Playa Paraiso. The Iberostar resort's Mayan pyramid helps remind you where you are -- and hints why you'll want to come back. 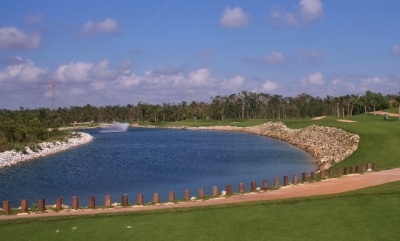 The Playa Paraiso golf course is worthy of the Iberostar name, and if you find yourself in the area, you should definitely ‘plan’ to play here – then be thankful that PB Dye designed it just as he went along. Acknowledgements: Our thanks to Mr. Ford Malmin and Ellie Malmin for their considerable ‘artistic’ contributions to the photography in this review. Note: PB Dye also designed another golf course for Iberostar, set to open in 2006 – at Iberostar Playa del Forte in Brazil. 12 months a year: Rack rate is $182. Iberostar resort guest (any of the resorts), $112. Rates include beverages and snacks from the beverage cart, as well as golf cart and range balls.